One of our favorite leisure activities needs to be dramatically reduced…and for good reason. Prolonged sitting or physical inactivity is the 4th leading risk factor for death according to the World Health Organization. Chronic prolonged sitting has the same mortality rate as smoking. There have been over 10,000 studies on the effects of prolonged sitting has on our bodies. In the past 100 years, our jobs and entertainment have driven us into a sedentary lifestyle that is detrimental to our longevity and good health. We have become accustomed to sitting for more hours than we sleep each night. There are some pretty alarming metabolic changes that happen when we sit for extended periods of time. I can hear some of you now…oh, but I workout and exercise. Well, guess what? Unfortunately, studies have shown that exercise only slightly mitigates the health risks of prolonged sitting. 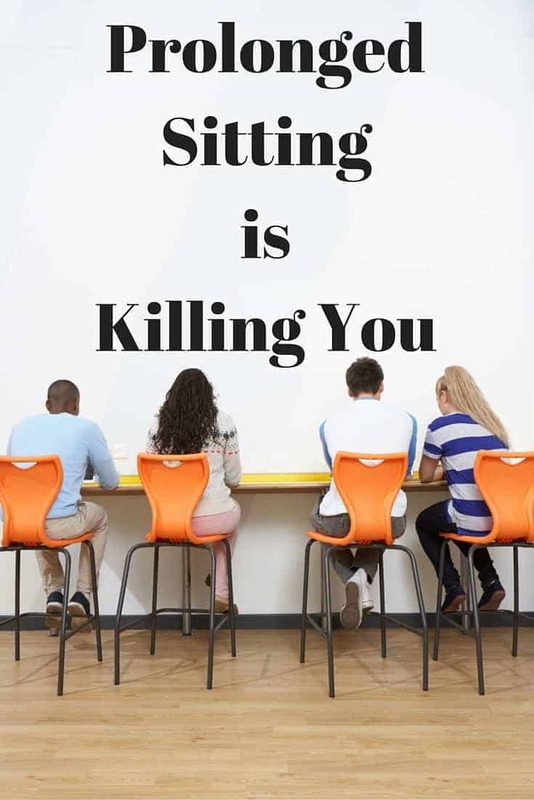 Studies have also shown that sitting can be as bad as smoking! How to Reduce Impact of Prolonged Sitting: Move, Move, Move! Have a desk job? Get a stand up desk. Or simply find something to lift your computer up a foot or more. Just beware, standing still for long periods is bad too. However, if you are already standing, chances are you will be moving around a little more naturally. I know we have all told our young children to stop fidgeting, but now we know, fidgeting is actually good for us! Take opportunities to stand when on the phone or reading paperwork. Need to discuss something with a fellow co-worker? Walk to their office instead of emailing when possible. Set an alarm to remind you to get up and move every hour. Find a flight of stairs to walk up and down a few times. Get moving! Commute on a train or bus? Opt to stand instead of sitting. Have a favorite show or sports game to watch on TV? Do some exercises while watching. Get a fitness tracker. It will let you know when to get up and move. The Fitbit Blaze encourages walking 250 steps every hour. The awesome thing is it only takes about 2-3 minutes to walk 250 steps. So easy to do. You can even walk it by walking about the house a couple times! Purchase a laptop/iPad holder such as this one to attach to your treadmill or exercise equipment to easily multi-task! Sit straight up with your spine in a J shape with your buttocks protruding slightly or sit at a 135 degree angle. Of course we can’t always avoid sitting. Sitting in moderation is necessary and ok. It’s when we sit for over an hour or two at a time without any breaks when the body is at a higher risk for the conditions previously mentioned. This goes right along with our healthy lifestyle goal of get up and get moving. Remember this lifestyle isn’t an hour of activity and then back to bad habits the rest of the day. It’s about incorporating an active, healthy life in all aspects of our day. Don’t sit more than 2 hours without getting up and moving for a few minutes. When sitting, sit either J shaped or slightly reclined when possible. Reduce total sitting time by incorporating some type of low intensity exercise along with sedentary activities such as TV viewing or reading. If you are interested in a 10,000 steps a day program – recommended, here is a very doable walking plan! Very important to know. I know when I have busy days at the computer, I must force a break to get up and move. It can be debilitating. I know exactly what you mean, and time flies by so quickly sometimes too. We can be sitting for over 2 hours easily without realizing it. Thanks for reading! The 1st grade in my son’s school last year had ball seats for the kids to use part of the day. That encouraged movement while still being able to sit and learn. Too much of anything is really not good. I make a conscious effort to stand up and move on days that I know I wont be working out. Wow! I never knew it had so many disadvantages. I always thought it would increase the risk of having a spine related health issue, but with cancer and other illnesses, I think I’d rather just stand-up. Oh geez, I do so much sitting it’s ridiculous! I need to get up more and move throughout the day. Such important information! I exercise, so I didn’t think I would be at risk, but now I see I am wrong. Thank you for showing all the stats. What interesting stats! There is so much that will harm our bodies and I am guilty of many of them – including sitting too much. Thanks for the reminder. Uggg I know this is SO so true and it scares me because I work from home – sitting at a computer – over 14 hours a day. I need a fit bit or one of those things that reminds you to get up and move – or just to simply set myself a timer. Its not a matter of laziness, but you can seriously get caught up in work and before you know it hours have flown by! Awesome post! I work in an office and on the days that I have to stay in, it can be grueling. I take my fifteen minute break everyday and go for a walk. Another suggestion is to invite co-workers to walk, make it a little more fun. Also going to the bathroom on a different floor or farther from your office works too. Wow these numbers are scary! I had no idea! I sit and blog for hours at a time too! Yikes! This is great information. I try to stand up every 30 minutes and walk for a while. These are great tips, I never had heard of some of them! Such interesting tips on how to sit! Thanks for sharing this! So happy the post was informative for you! Thanks for reading!